Leica has announced a new 20x optical zoom camera to sit in its line-up of compacts. The camera features a 15.3 million pixel 1/2.33 inch CMOS sensor, and includes a Leica DC Vario-Elmar 4.3-86mm f/3.3-6.4 ASPH lens with a 20x optical zoom. Equivalent to a range of 24-480mm in 35mm terms, the camera is aimed primarily at those travelling or visiting events. Leica promises that the new sensor can deliver high quality images in a range of shooting conditions, with sensitivity ranging up to ISO 3200. An autofocus speed of 0.1 seconds is claimed to offer fast and accurate focusing, even on moving subjects. On the rear of the camera, a 3 inch touch screen LCD gives access to the camera's key controls, while an integrated GPS function allows location information to be captured. A number of shooting modes are available, with continuous shooting of 10fps at full resolution, or 60fps in high-speed mode. Creative modes include miniature, panorama and retro. Full HD video recording is also available, while an integrated stereo microphone is included with an electronic wind noise filter for clearer sound. 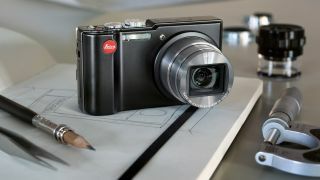 Packaged with Photoshop Elements and 10 and Premier Elements 10 for video processing, the Leica V-Lux 40 price is £550 (around $885) and it will be available from May 2012.